Newcastle Sleep Dental is happy to offer its patients the opportunity to replace missing teeth with the most permanent option available- the dental implant. Implants have been proven to be a long term solution to missing dentition, which can be a cause of lowered confidence and lessened functionality for many people. Dental implants are most simply explained as artificial tooth roots that are inserted into the jaw bone to replace missing natural teeth. An artificial tooth is then secured to this medical grade titanium root to mimic as closely as possible the function and look of real teeth. 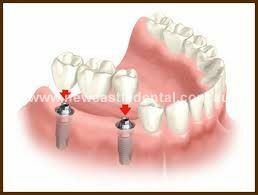 Dental implants can be used in several ways according to the needs of the patient. Implants can be used to replace a single tooth, several teeth on an implant retained bridge, or an entire arch with an implant retained denture. These are described in more detail below. 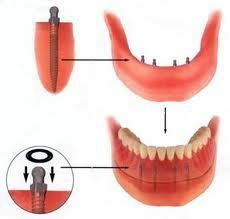 This method involves replacing a single tooth (or multiple if desired, using one implant per tooth) by inserting a custom made crown securely to the top of a dental implant. This treatment is completed over several appointments. Using this method, we can replace several missing adjacent teeth. It involves using 2 or more dental implants as anchors in the jaw bone (similar to those described in the Single Tooth Replacement). Between these anchors we secure the required number of artificial teeth to completely close the gap. These artificial teeth are specially constructed for each specific case, and will be matched as closely as possible to ensure the most natural looking fixed solution. This option has become increasingly popular for people who are suffering with ill-fitting dentures. Often referred to as “mini implants”, this method of tooth replacement involves the insertion of four or more implants into the jaw bone that act like clips for your denture. The denture is custom constructed by a prosthetic technician to be a perfect fit for these implants, ensuring the prevention of movement and the dramatic improvement in the ability of the denture wearer to chew and speak properly. This option is most popular on the lower arch, which is notorious for preventing the perfect fit of a full denture, but can be applied to the upper arch if necessary. All implant procedures are conducted out of our Charlestown surgery by Dr Damian Lloyd. Dr Lloyd works very closely with a local dental prosthetist to ensure that the patient is completely happy with the fit, shade and shape of their new teeth. He only uses the highest standard of dental implants from Nobel Biocare, Biomet 3, 3M, Straumann and Adin. For more information on how dental implants could benefit you or to make an appointment for your first step towards your new smile, please contact our Charlestown branch.